Twitter contest: Michael Miller 'Tweet Tweet' Giveaway! It's Wednesday night, and LindsaySews just passed 300 Twitter followers. Tweet Tweet! Thanks to all you lovely crafters, I've been inspired to host the very first give away. 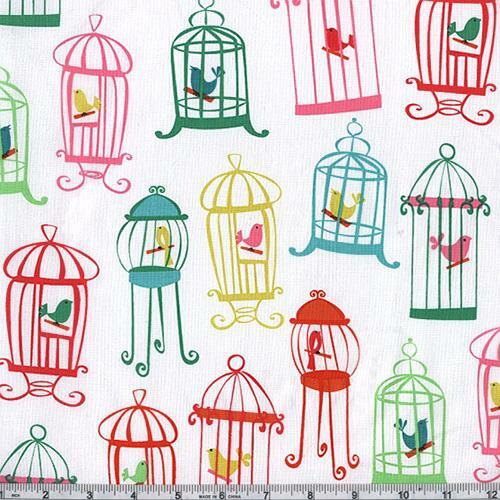 One lucky crafter will win 1 yard of Michael Miller's "Tweet Tweet" fabric, pictured below. 3) If you don't have Twitter, follow Lindsay Sews Facebook page and comment with the name of your favorite craft book/blog there. It's that simple. Winner will be chosen via Random.org and announced via Twitter/Facebook on Friday, Dec. 3 at 9pm (EST). (Open to participants in the U.S, Canada, U.K. and Australia.) Tweet Tweet! I tweeted this! Said my favorite blog was Lindsaysews. Hope you have many entries. What the heck...not open to Canadians? I tweeted @3birdsstitch. The fabric is adorable! Just tweeted, that fabric is so cute!